You wouldn't put a plastic A/C unit in your backyard. Why settle for less with your heat pump? Rheem is the only heat pump on the market with a steel case. 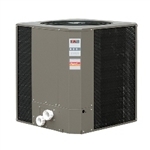 Avoid expensive replacements and make a Rheem the last heat pump you need to buy. Its compact design features a durable steel case, made to withstand common corrosion and direct impact. Anyone will tell you that a heat pump is a great option to heat or cool your pool and is more affordable than gas, propane or other methods. But only Rheem takes heat pump technology further, giving you even more cost savings than anyone else. We've completely re-engineered key elements of the heat pump to maximize efficiency and drive down energy bills. Whoever thought doing something good for the enviroment would also save you money? It's true! A Raypak heat pump is built with the lastest eco-friendly R410A refrigerant that operates more efficiently than R-22. But the most amazing aspect of a heat pump pool heater is its operating efficiency compared to gas heaters. A heat pump operates at 5 to 6 times the efficiency of a standard gas, oil or electric pool heater. If you live in an area where your natural or propane gas costs have outpaced your electricity costs, the savings can be big. The chart below illustrates just how much money can be saved using average energy cost data. While it's true that nothing beats a gas heater for bringing your pool or spa up to temerature rapidly, it can be expensive to operate. Keep in mind that with a gas heater, you also need to run expensive gas lines or install an unsightly propane storage tank. Raypak units operate quietly, cleanly and most of all efficiently. Installation is no harder than installing a pool pump. Now you can trust your backyard investment to the same people who have been in homes across America for over 70 years. Your Raypak heat pump is designed to provide years of safe, reliable service, and save you money over the time compared to ther heating methods. Ask your us for more details! Raypak pool heater heat pumps are the only heat pumps manufactured by a mahor air conditioning company, Raypak's parent company Rheem. 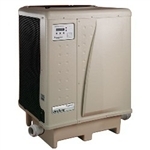 Rheems HVAC product lines have successfully utilized heat pump technology for over 30 years. By taking our field proven technology and combining it with our industry leading pool heating products, we have developed a heat pump pool heater that is second to none. In the unlikely event that you have a service problem, one toll-free call will have your heater up and running again. It's that simple. Raypak heat pumps are truly hassle-free. Raypaks exclusive DuraSteel Cabinet is zinc chomate plated and polyester powder coated, making it non-corrosive and much more durable than a plastic cabinet. It's the same rugged construction used by all the major air conditioner manufacturers. Raypak is the only heat pump manufacturer that offers either a digital or analog control for its heat pump line. We have you covered with the best of both worlds. Our digital control is easy to use, has a pool and spa temerature setting as well as full diagnostics. For those that prefer analog, Raypak offers our direct set thermostat. The easy-to-read, easy-to-use dials allow you to set your water temerature just the way you like it. Gone are the days of the guesswork involved with having to choose between the "blue & red swoosh", like on your car's A/C....now you have the temerature targets displayed right on the dial. And they said it couldn't be done....Titanium has gained world recognition in just about every industry for its "nearly unbreakable" qualities. In the past, titanium's rigidty made it nearly impossible to use in an ultra-efficient heat exchanger design. The spiral rifled tube increases the surface area where super-heated gasses can transfer heat efficiently to water. A titanium tube heat exchangerprovided a truly efficient waterway that withstands the abuses of harsh pool chemistry and corrosion. the spiral "rifled" exchanger also helps reduce deposit build-up, and increases efficiency by performing a "scoop-and-lift" action. While neither titanium nor rifling is new to the heat pump industry, leave it to Raypak to bring the best of both worlds together to maximize your backyard investment! The Copeland Scroll Compressor in your Raypak heat pump is the same workhorse that is used in million of air conditioners all around the world! The simple design of the Copeland Scroll Compressor builds in reliability and allows it to operate at lower sound and vibration levels than reciprocating compressors. In fact, test have shown that Scroll compressors are up to three times quieter than reciprocating models. Durability is based on a very robust design and contains only a few moving parts. Because the Copeland Scroll compressor starts unloaded, strain on the motor is considerably reduced. During rough operating conditions, spiral components within the unit reposition themselves to protect the compressor from damage. Millions of air conditioners can't be wrong...the performance of Copeland Scroll compressor gets better with time: it "wears in" not out. Specially designed "Swept Wing" fan blades operate more efficiently and generate minimal sound. Raypak heat pumps are packed full of premium quality components. The Premium Emerson permanent-split capacitor (PSC), sealed ball bearing motor is matched specifically for the fan blade assembly, which allows optimum efficiency with extended motor life. A Raypak heat pump can turn your backyard pool investment into a resort-style living almost year round. Get the most out of your pool by keeping it comfortable and open longer. raypak heat pumps give you the flexibility of warming your pool water in the months before and after your normal swim season. Your backyard evening events are rarely slowed down by cool weather when you have a Raypak heat pump on duty. Raypak air-source heat pump pool heaters work much like a refigerator in reverse. The heat pump extracts the heat from the warm air, intensifies the heat with a compressor, delivers the heat to the water, and exhausts the cooler air out the top of the unit. Beecause it uses the warm ambient air temperature to do the work, it is a very efficient way to heat water. One of the biggest misconceptions about a heat pum's operation is what happens to the energy used to run the heat pump. For the most part, this enery does not go into the water. The electricity powering the unit operates the compressor and fan, along with the other controls and electronics. The electrical input energy if converted to BTU's only amounts to roughly 14,000btu. the bulk of the btu output comes from the heat energy extracted from the air. That's why they operate so efficiently and the energy savings are so significant. C.O.P. stands for Coefficient Of Performance. It's the way efficiency is measured for heat pump pool heaters. Believe it or not, it's a very simple calculation. BTU Output / BTU Input = C.O.P. Below is an example of the C.O.P. calculation for the Raypak model 5350ti. So based on the calculation above, a Raypak heat pump delivers efficiencies in excess of 600%! The highest efficiency a gas pool heater can possibly obtain is 99%. The mystery is solved! We thought you would never ask! Raypak is a proud member of AHRI. 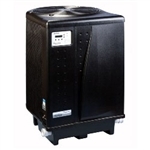 Our heat pump pool heaters are third party tested and certified under the AHRI 1160 standard. All performance numbers are listed on the AHRI website directory. The units are tested at a high ambient temperature condition and a low ambient temperature condition. Furthermore, most Raypak units meet or exceed the Florida 4.0 minimum C.O.P. requirement and are listed with the California Energy Commission. Unfortunately, not all manufacturers belong to AHRI and their published test data is questionable at best. When shopping for a pool heat pump, look for the AHRI Certified logo. This ensures that you are getting what you pay for, without the smoke and mirrors. raypak heat pumps are also safety tested and certified by Intertek, another third party testing agency. This ensures taht all components and electrical design meet or exceed the UL-1995 standard. Raypak Heat-Cool units extend your swim season even longer! Just the right heat pump for climates that have cooler-than-comfortable temperatures, but also have extremely hot summer months. With a Raypak Heat-Cool heat pump, your water temperature will always be comfortable. Just as house-holds around the world have trusted us to heat their water during the colder months, Raypak will have you relaxing in your pool during the hot days of summer with cool, refreshing, chilled pool water. having the ability to pull out the extra degrees Mother Nature puts in will make your pool the envy of the neightborhood. No matter what time of year, Raypak Heat-Cool will have you swimming when others won't venture outside. Raypak Heat-Cool units have a unique reversing valve which enables the heat pump not only to take the chill out of the water, but also to put it back in, cooling your pool water during the hot summer months! Normally, a heat pump will gather heat energy from the air with its evaporator coil. Using refrigerant and several other components, the heat is transferred over to your pool water. By reversing this process, the heat pump can actually take heat out of the water, transfer it to the Freon, and run it through the evaporator coil. the coil dissipates the heat into the air, much like a car's radiator. This is also the method of defrost for the heat-cool model. In cold ambient conditions, a heat pump will ice-up when the ambient air drops below approzimately 45 degrees. Wtih a heat-cool unit, the ice will melt off in a matter of minutes when in defrost mode. Standard heat pumps rely on the ambient air being drawn across the coil which could take hours to defrost, depending on the air temperature. There are some climates that can challenge a heat pump's performance. Areas that are subject to lower ambient temperatures have a tendency to cause ice to build up on a heat pump's condensing coil. This ice could damage a heat pump's internal components while starving the unit of the air flow it needs to work properly. to combat this, most manufacturers build their heat upmps with a "Defrost Mode". What most manufacturers don't tell you is that their units cannot heat your pool water while defrosting the coil. ice that may be forming ont he coil without stopping the heating process! This means that a Raypak Power Defrost heat pump gives you the freedom to continue to heat your pool water even when the unit is defrosting itself. So while your neighbor's "other brand" of heat pump has stopped heating the water and is still trying to "break the ice", you and your family will be swimming!